PWT Pro Daryl Christensen nets $63,000! 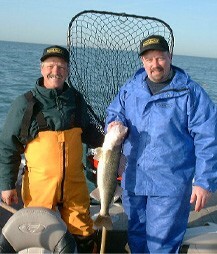 One of my most pleasant surprises was how well my StowMaster net handled the big fish at Erie. Since I knew these fish would be mostly over 10 pounds and 30 inches long, I opted to go up to the salmon series. The net performed extremely well, even when fully extended while netting in waves from the stern. We never lost a fish because of the net and that makes a big difference in tournaments. I was amazed that a net that folds so compact could work so well. I even had an extra one in the boat and neither was in the way because I could fold it between netting fish. I will be using this net again at Dunkirk, NY on the east end of Erie in July. The fish will be over 10-pounds there as well. For normal-sized walleyes, however, I”ll stick with the walleye series from StowMaster. This net handled every fish like a dream at Lake of the Woods and we netted more than 30 fish during the event, some over five pounds. Again, no fish were lost at the net and that says something when trolling crankbaits.